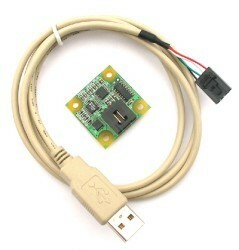 Phidgets Inc. has released the PhidgetAccelerometer 3-Axis +-3G. The Accelerometer module provides vibration, tilt, and acceleration sensing. The module is calibrated at the factory and comes ready to use; it connects to a PC or a MAC through the USB port. The product is designed for quick prototyping and can be used in a wide variety of applications. “In the past users had to use multiple Dual Axis Accelerometers in order to track vibration, tilt and acceleration. We have now made it a lot easier by putting all the required functionality on a single cost effective module” says Chester Fitchett, CEO of Phidgets. – Noise level: 6 milli G.
The accelerometer is controlled through APIs (Application Programming Interfaces) under Windows, Windows CE, Mac OS X, and Linux. The programming languages supported include Visual Basic, VB.NET, C#, C/C++, Flash/Flex, Java, Labview, and Matlab. – Sensing tilt in remote operated vehicles. – Estimating velocity and tracking acceleration in race cars or remote control cars. – Capturing motion input for gaming. – Capturing motion input for Human Interface Research. – Capturing long term vibration data to help with the analysis of machinery performance. – Detecting movement or presence by measuring structural vibration. The Accelerometer 3-Axis +-3G module is available now at Trossen Robotics. The suggested resale price is CAD $95. Phidgets, Inc. is a technology leader in the design and manufacture of low-cost control and sensing modules connected to personal computers. Phidgets products are ideally suited for fast prototyping. The privately held company is based in Calgary, Alberta, Canada. Trossen Robotics is proud to be the United Stated reseller of the Phidgets product line.